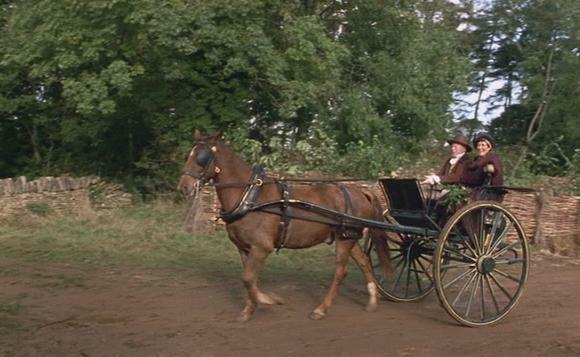 Had Margaret Dashwood fallen from a tree and broken her forearm, Mrs. Dashwood would have sent for the surgeon to set it. A broken bone presented a painful procedure in a time before anesthesia, but simple fractures of the arm were relatively easy to fix, even in the late 18th and early 19th centuries. In reaction to the injury, muscles contract and are stretched before the bone is set. Arm muscles do not offer undue resistance. Thus the bone of a forearm can be set without too much exertion on the part of the surgeon or bone setter. Once set and placed in a sling, the arm bone required time and rest for healing. If Admiral Croft, a notoriously bad driver, had overset his vehicle and tossed poor Mrs. Croft to the ground, breaking her leg in two places, the situation would have been different. The size and strength of her leg muscles would have been so much stronger than Margaret’s arm muscles, and the exertion to set Mrs. Croft’s bone in place would have required more effort and required the work of at least two persons. A fracture in Mrs. Croft’s lower leg would have been easier to remedy than a fracture of the thigh, in which large and strong muscles would experience a great degree of contraction and shortening. Considerable manipulation would have been required by several assistants to overcome strong thigh muscles and stretch them in order to place the bones in their natural position. If, after the pulling and resetting, both limbs were the same length again, then the procedure was succesful, but this was not always the case. Soldiers on the battlefield whose bones shattered from canon and gun fire risked getting an infection. In such instances, surgeons often chose to amputate before the tissue became necrotic. As early as the 16th century, apprentice barber-surgeons were impressed in the army to treat soldiers, where they learned their trade by neccesity Generally, surgeons and bone setters learned how to set various kinds of fractures through apprenticeship. Not all bone setters were apprenticed to a medical person. If no surgeon or physician lived within the vicinity, the local blacksmith would set bones in humans and animals, for a fee, of course. Some bonesetters became celebrated for their dexterity. One such person in the early 18th century was Mrs Mapp, whose skill was legendary. 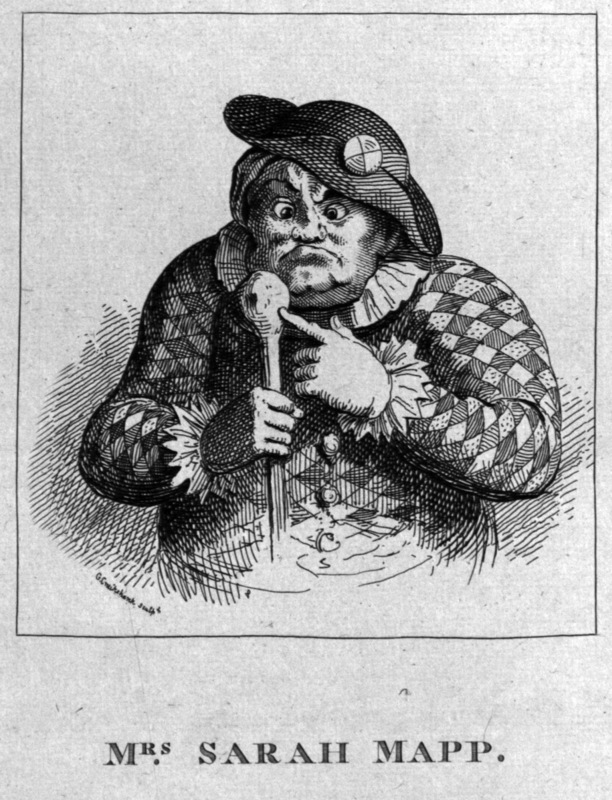 A daughter of another famous bone setter, Polly Peachum (who married the Duke of Bolton), she was known as crazy Sally. Nevertheless, her “cures earned her upward of 100 guineas per year. Sally Mapp’s marriage was not as successful as her skills with bones. Her husband thrashed her several times before absconding with a majority of her earnings. As the medical professions evolved, barber-surgeons, midwives, and professional bone setters like Mrs. Mapp, began to be replaced by trained male physicians and surgeons. During the 19th century, colorful characters like Mrs. Mapp, and midwives, who had widely practiced across all spectrum of classes, labored primarily for the poor and could barely scrape a decent living. 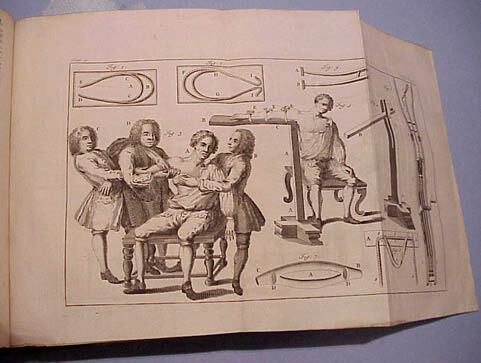 Over the centuries, scientific inventions sped up a surgeon’s or bonesetter’s ability to help patients. As early as the 15th century, the printing press churned out medical manuals, in which medical procedures were standardized and disseminated over the world. 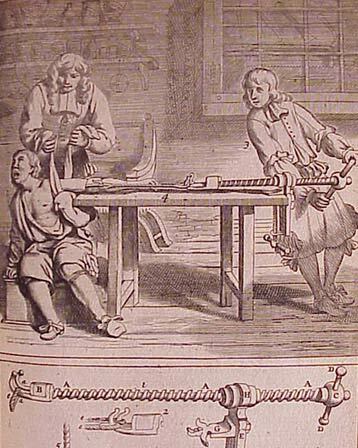 In the late 17th century, traction was used to repair a broken bone, and in 1718, French surgeon, Jean Louis Petit, invented the tourniquet to control bleeding, a medical technique that was especially helpful during amputations. Bone setting could be extremely painful, and pain was excrutiating during amputations. Before 1853, only a few substances were available to dull pain, but these efforts were generally unsuccessful and many surgeons relied on their patients to faint from pain as a method of relief. A person in shock would feel less pain and bleed less, for their lower blood pressure would reduce the flow of blood, in the case of a jagged bone. During the latter half of the 18th century and early 19th century, there were several missed opportunities for finding an effective anesthetic. In 1773, Joseph Priestley used nitrous oxide, a gas that was difficult to synthesize and store. Humphry Davy commented in 1800 that nitroous oxide transiently “relieved a severe headache, obliterated a minor headache, and briefly quenched an aggravating toothache.” No one seems to have taken that observation further. Humprhy Davy also realized that inhaling ether relieved pain, but remarkably, ether was considered a recreational drug during this period. In Britain and Ireland, when gin was taxed to the point where the poor found the cost prohibitive, they began to drink and ounce or two of ether instead. In America, students would hold nocturnal “ether frolics” by holding ethe-soaked towels to their faces. By 1846, the situation had changed. Ether had made its appearance as a pain reliever, and chloroform was introduced for operations a year later. In 1853, Queen Victoira requested chloroform when giving birth to her eight child, and from then on it was accepted practice to offer pain relief to women in labor. Yikes! I think, if I lived then, I would simply wrap myself in cotton wool and stay inside, in a properly safety-enhanced room, of course. I got half way through this VIc. It’s extremely well written. Just thinking about broken bones, the pain, the difficulty involved if the muscles are powerful like the thigh muscles……I’m afraid I had to stop. I’ve seen, and what’s worse, heard people get multiple fractures on the football field. It all began to bring back unpleasant memories. I had to stop reading. The detail you describe the broken bones and the complications of setting them is very IMPRESSIVE. Wow I’m so relieved we’ve come such a long way. Thankfully I’ve only had one broken bone in my life. Unfortunately each of my kids has had at least one also. on October 9, 2010 at 14:26 Morgan P.
How gruesome! As much as I fantasize about living in Regency England, I’m endlessly thankful for modern medicine and hygiene. But I’ve a query: as pictured, aren’t the Crofts riding in a gig, not a curricle? I know it’s a gig in the book and both are light, two-wheeled vehicles, but aren’t curricles pulled by a pair? What a hilarious title! It was interesting to read about pain relief in those days, and this is one reason why I probably wouldn’t have enjoyed living back then… to think about having a tooth pulled about, let alone being amputated!! Ouch. Fascinating! I pushed on to finish the article but I agree with Tony that it was difficult to read of such pain. 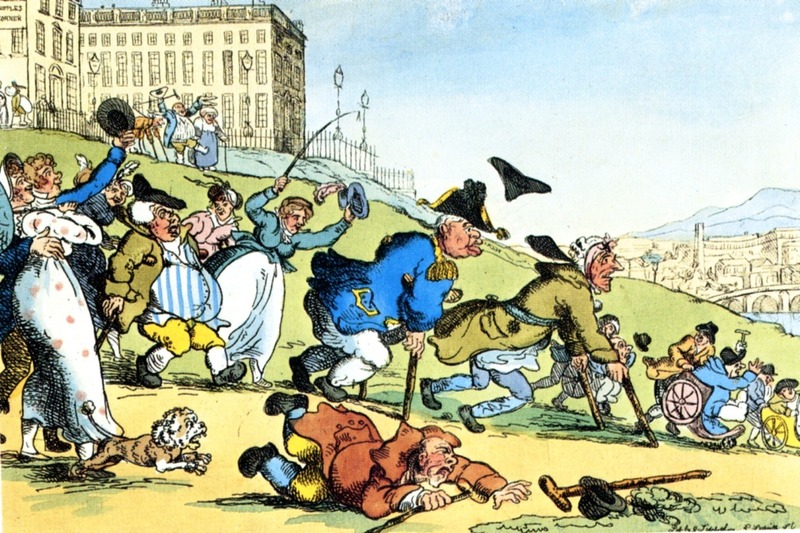 We certainly have romanticized the 18th and 19th centuries. This helps put balance to our ideas. That sounds absolutely awful, bone setting. Just proves once again why we ought to be thankful living in the modern world. Even with anaesthesia, there was a weird feeling, when I once had a tiny operation on a leg. I can’t imagine how it would be, the pain when the bones are being set by bare arms. Thank you very much! Most informative, and I think this will help me in writing my Regency romance. But goodness sake, I do feel sorry for poor Geoffrey, the lad in my story with the broken limb. i am Dr Shahid Latheef. i went thru ‘Setting a broken bone’, it is intresting to read. Morel is the one who introduced tourniquet in 1674 and it became popular in Europe at that period as by Orthopaedic text Campbell. ” Further advances were made possible by Morel’s introduction of the tourniquet in 1674”. Campbell’s text book of orthopaedics 11 th edition in chapter of amputation – general principles. But ur book says it is Jean Louis Petit a French surgeon who introduced tourniquet in 1718. Thank you for this article. It is very helpful for me as I am writing fiction that takes place during this time, as well.